This is the problem with history and everything that came before and how things change. Let me tell you a story. Way back in 2002 (yeah, we only had B&W back then) or so, before there was a bean to bar movement, before ANYONE made chocolate at home I started working on how to do just that. Roasting was no big deal as I was already roasting coffee and once I sussed out the new temperature ranges it fell mostly into place. I needed to work out how to crack and winnow the beans but figured until I could make liquor that step could wait. It was just engineering. So I started experimenting with a slew of household kitchen appliances to see which ones would turn roasted nibs ( I bought my first ones from Scharffenberger and even then thought they were over roasted) into liquor. No, really. A lot. The knowledge that virtually everyone now takes for granted (in no small part I like to think due to my failures) did not exist then. I tried food processors. In short order the blades just spin through the nibs. FAIL. I tried coffee grinders. The oils caked the burrs. FAIL. I tried the vitamix. It scorched the nibs. FAIL. I tried blenders. See food processor above. FAIL. I tried centrifugal juicers. That almost worked but spun to the edge. FAIL. I tried meat grinders. FAIL. Yes, I even tried a mortar and pestle. Bloody epic FAIL. At some point I was visiting a fellow coffee friend and telling him my woes and he suggested the juicer he had. It was this thing called a Champion Juicer. I was skeptical since the other juicer failed but I figured why not. I brought over some roasted nibs and tossed them in. At first it didn’t look promising. We stalled the motor pressing too hard. Crumble came out the front. But I noticed the snout was getting warm and waste not want not I tossed the warm crumble back through and suddenly magic happened. Liquid chocolate gold started pouring out the bottom. SUCCESS!!!! Quite literally at that moment, in a hot crowded garage in Roseburg Oregon Chocolate Alchemy was born. I know if I could make liquor easily the rest were just pesky details to be hammered out. 2) Gritty chocolate is more viscous than smooth chocolate and is REALLY hard to temper. And speaking of gritty, check out these gritty photos. Speeding along, I eventually found the Santha Wet grinder, hacked it (even then my favorite tee-shirt said “I void warranties”. They modified it per my requests and the Spectra 10 Melanger was born. 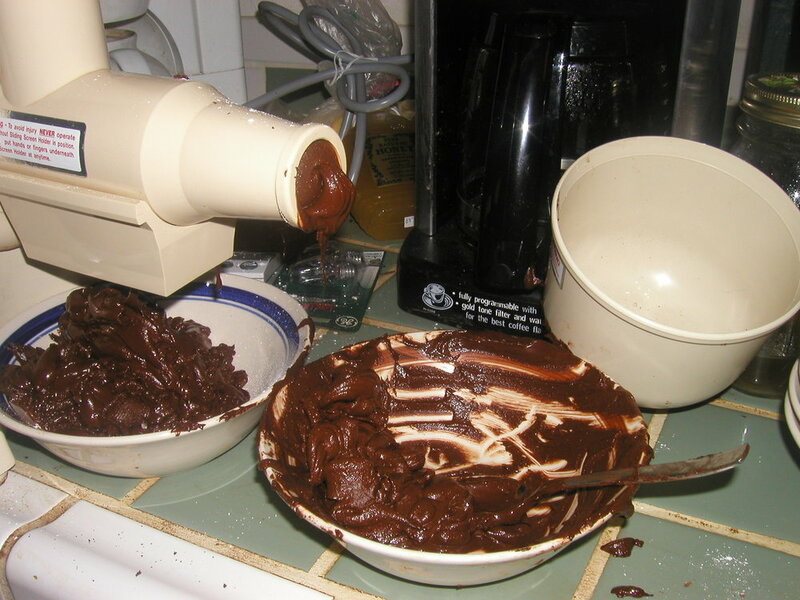 At that time the procedure for making chocolate was to roast the beans in the oven, an RK drum or Behmor 1600, crack with a Crankandstein cocoa mill (or hand peel - see image below), winnow with a blow dryer, make liquor with the Champion (which also removed residual husk) and refine in the Santha. The Santha could not handle nibs directly. It would bog down and stop. But times change. No more hand peeling for one and little hand winnowing unless you really want to. The people who made the melangers split off and became Spectra and they came out with the Spectra 11 which could handle nibs directly. I also discovered that the Champion would crack cocoa beans if you took off the lower screen and I liked it better than the Cocoa mill since the Champion cracked nibs winnowed better in the Sylph I invented. All this is a way of saying that there are now options. That is why there seems to be contradictory information. At the time of writing many years ago you absolutely needed to use the Champion to make liquor as the melanger could not handle nibs. Now you don’t need it for liquor but it is still really useful for cracking the beans. You just have to decide what path you take to get to your destination of finished refined chocolate. I made the video showing how to make liquor with the Champion because people asked me to. But making liquor isn’t a requirement. It is only an option you can choose to exercise or not at your discretion.